Here’s release note of version 3.3.2. [iOS] Voice setting menu is added. Voice Name: You can set Voice’s language and gender. Voice Speed: You can set how fast to read. Voice Pitch: You can set Voice’s pitch. Note: When you set a voice, a text in the language you selected for TV Friends, “This is a voice of speaking,” will be pronounced. However, there is a case the voice cannot pronounc if the voice cannot speech the application settings’ language (e.g. the case you set Japanese for the application language, but selected English voice). The voice setting itself is still valid, and the voice will speak chat comments if it’s readable for the voice. A first boot dialog will be shown to introduce TV Friends on Title Screen. A dialog which ask you if you want to set your avatar randomly will be shown if you press OK without selecting any avatar on Avatar Selection Screen. An error dialog will be shown if you press OK without selecting all of Country/Region, Area, Channel, and Room. When a match of 2018 FIFA World Cup start soon, a notification will be sent to you. 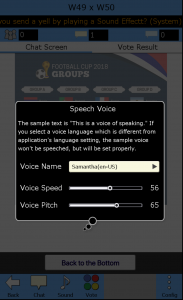 A bar position of Voice Volume setting in “Text-To Speech” config is fixed. In Japanese version, a problem that a button text, “Apply and Quit,” wasn’t translated is fixed. A problem that there was a possibility that the application may crush during Twitter authentication. A probrem that users could add a space after their handle name is fixed.